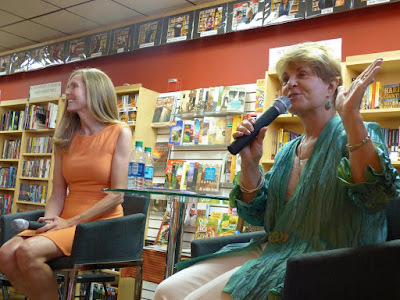 Anne A. Wilson at The Poisoned Pen! 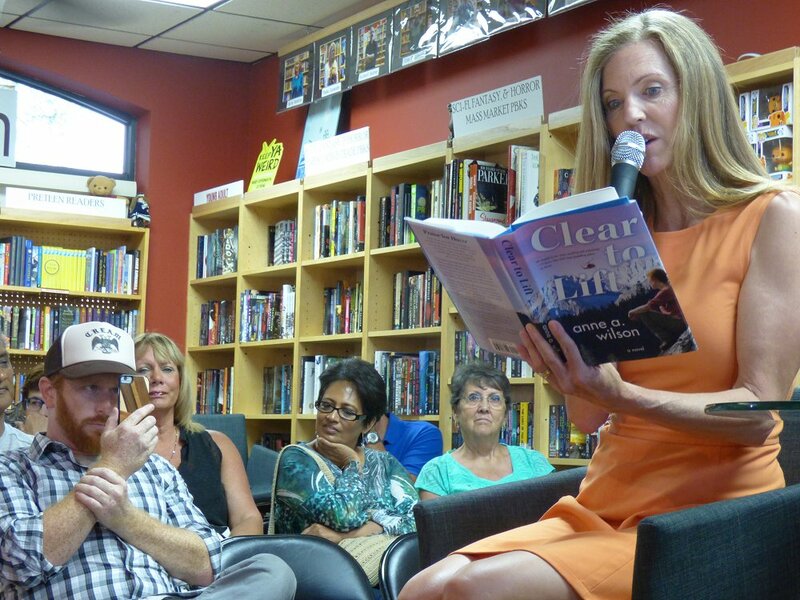 Things were back to normal: Denis was at work, and I was driving solo to The Poisoned Pen to see Anne A. Wilson, author of Clear to Lift, one of my Best Reads of 2016. The one thing that wasn't normal? The traffic. Instead of the usual rush hour congestion, I hit stretches of Indian School Road that barely had any vehicles on them. It made me wonder if a lot of folks had escaped the Phoenix heat and were now clogging the streets of San Diego. Once I'd made my purchase and gone to the table in the back to sit and read, I got to watch the event pros at work, seeing how many chairs they could safely fit into the space. (They were expecting a large turnout, and they got one!) All this meant that I had to move, but I didn't mind. I had a ringside seat for an impromptu signing. 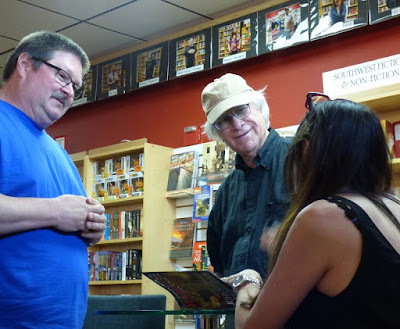 Authors John Sandford and (wife) Michele Cook had stopped by to sign copies of Rampage, the third in their YA thriller series, and had graciously said that they'd stay for a bit to sign books and chat with fans who wanted to stop by. Several fans took them up on their offer while Poisoned Pen staffers were busily getting ready for the main event. Anne and her family showed up early, too. Anne's sisters had brought tons of goodies for the launch party. Launch Party goodies! Photo Credit: Jeff K.
Once that table was loaded, it didn't take but a second or two for a line to form to sample everything! 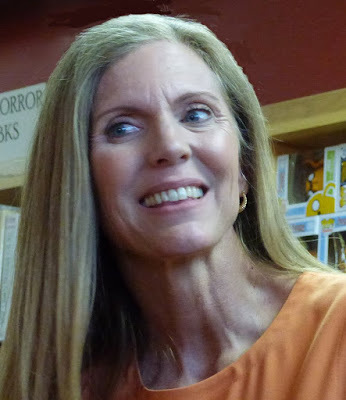 When host Barbara Peters introduced Anne, she told us that some big names (like Dennis Lehane) had books being released the same week as Wilson's first book, Hover, but that Wilson's book had outsold them all. Then Peters told us that her husband Rob found a cruise that he wanted to go on. It starts in Alaska and travels way up north and east along the coast of the Canadian Arctic. We're talking seriously remote here, and the people in charge make everyone going on the cruise jump through extra hoops so that they will know just how remote the area is and that, if anything were to go wrong, the chances of getting everyone to safety might be more than a bit dicey. "With all your experience in search and rescue and survival," Peters told Wilson, "I'm going to be asking you for tips after the program!" 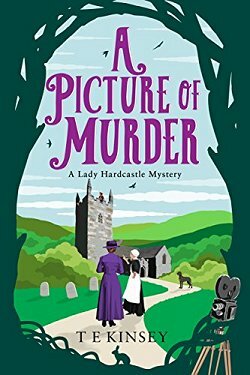 Barbara Peters and I are in agreement: one of the things that makes Anne's books so very moving is the fact that she's done what she writes about. She was a Navy helicopter pilot. She did fly search and rescue. She has had to land a helicopter on a ship in rough seas. She has had to hover just a few feet away from the sheer rock face of a mountain. (And her writing makes you feel like you're right there with her.) When Barbara asked her about the background for Clear to Lift, Anne told us that during her second tour in the Navy, she was stationed at Fallon, Nevada, where the book is set. 80% of the search and rescue work she did was for civilian groups, and she did it for three years. "Have you ever had to be rescued?" Barbara asked. "No, I've only played the victim for some of the scenarios we were running in practice," Anne replied. Peters then mentioned the Stupid Hiker Law that has been proposed in the state legislature once again. We've long had a Stupid Motorist Law, which means if you're driving here, ignore all the signs warning you not to cross flooded areas (happens a lot during monsoon season), and get stranded out in the middle of raging flood waters, you will be rescued, but you'll be presented with a bill for how much it cost to save your sorry behind. The local government spends just as much on stupid hikers who have to be rescued from the sides of mountains, and if I remember correctly, at least three hikers died when they decided to go hiking (with little or no water) when it was 118° a few weeks ago! Anne understood the need to try to curb these rescues, but she was in the military at the time, and the military saw these searches and rescues as gestures of good will towards the communities. 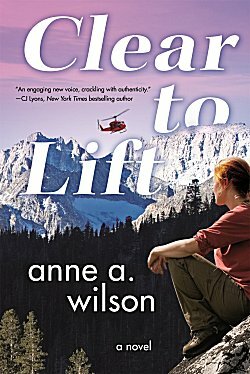 "I'm currently writing a thriller set in the Pacific Northwest, and yes, it does involve helicopters," Anne told us. "Are you still a certified pilot?" "I haven't flown since I was in the Navy-- eighteen years ago. It was so much fun, and I loved all the precision work." Although Anne kept journals while she was on deployment at sea, she only became interested in writing seven years ago. "I suddenly had the idea for the kind of book that I would want to read, so I sat down and wrote the first chapter," Anne said. 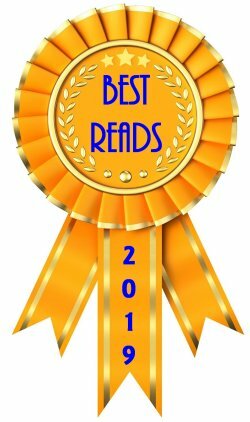 She also wrote "three works of epic fantasy and one medical thriller." To hone her craft, she took classes and joined online writing groups. "What are some of the books you like to read?" Peters asked. 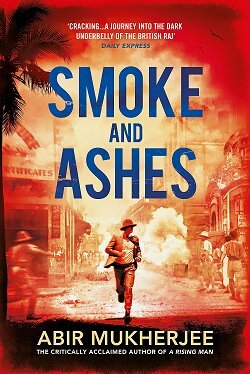 "I really enjoy thrillers... Lee Child, Brad Taylor, Brad Thor... but I also like Nora Roberts. My reading is all over the map," Anne said. Barbara then told us about a trip to Annapolis when she and her husband were at one of the swimming pools in the Naval Academy. One of the tests the cadets must pass is jumping into the pool from (roughly) the height of a ship. That is a very long jump, and one young female cadet had a meltdown. She just couldn't make the jump. "So... was that it?" Peters asked. "Yes," Anne replied. "If she couldn't do it, her career with the Navy was finished, and that is so sad!" "I kept hearing about a Sub Squad. What is that?" Barbara asked. "The Sub Squad is composed of all those who couldn't pass the individual tests. One last chance for them," Anne replied. Anne is now a swim coach who works with those who have had near-drowning experiences and adults who cannot swim. "I was surprised when I found out how many adults can't swim," she said. Anne then read part of one of the rescue scenes from Clear to Lift. "My first 'dramatic' reading," she laughed. After that, it was time for some questions from all the fans who had come to her launch party. One fan wanted to know about the scene she'd just read-- did that really happen? "That particular scene is a composite of several real life scenarios that I experienced," she said. "The last scene in the book is real. A one-hundred-year flood occurred in 1997 in the Yosemite and Reno areas, and I took part in the rescue." When Anne was in flight school, they were taught on single-engine helicopters. During one flight, they lost that one engine and landed in a field where a woman came out of the house and offered them all pie and coffee. Where did she get her main character's name? Alison Malone was her roommate for three years. Her first "dramatic" reading-- being recorded & also listened to by a fellow author! "One of the things I've learned in this publishing business is that you've got to nail your genre," Anne told us. "People have had a hard time with my books. Do they shelve them in the romance section? Are they thrillers? That's one reason why I'm writing a straight up thriller for my third book. There won't be any confusion!" Another fan wanted to know which was scarier: landing on a pitching ship or flying two feet away from a mountain side in unpredictable winds? "They're equally scary!" Anne said. "Have you saved lives?" Another fan wanted to know. "I saved thirty-one lives while I served at Fallon, and I saved a crew while I was deployed at sea," Anne replied. "The people you save do keep in touch with you by the way." A voice from the back then declared loudly and clearly: "One thing my sister will not tell you is that the U.S. Navy awarded her a medal for Rescue of the Year for her work in 1997!" Loud applause followed. 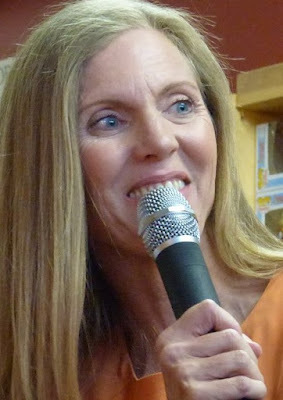 Author Shona Patel wanted to know if Anne had any Hollywood deals in the works. "No, I don't!" Anne replied. "Do you miss your work?" "Yes, I do miss it-- especially the people I worked with," Anne said. Anne A. Wilson may miss the work she did and the people with whom she worked, but I for one am very glad she turned to writing. I love the stories she tells. Anne's 5th grade teacher came! Photo Credit: Jeff K.
Ah, those PP signings always sound like so much fun, Cathy! And this one had great food, too! I'm glad for you that you have this opportunity. 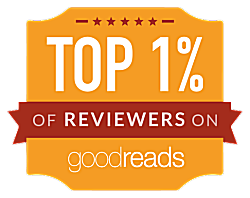 So am I. I am one lucky bookavore!